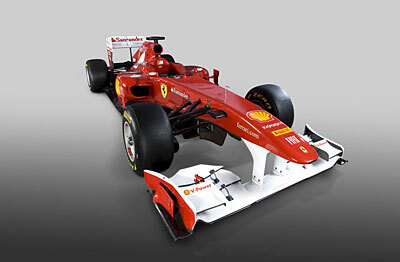 La Scuderia got the ball rolling once again – typically being the first Formula One Constructor to launch its new challenger, which it did so at Maranello, before Fredrico Suave (Fernando Alonso) gave the new beast its shakedown “Promotional” run next door on the companies Fiorano test track. And I will not even attempt describing any of the Technical Rules changes that affect the 2011 chassis, albeit I think the moveable rear wing is a JOKE! Whilst teams are also forced to spend countless millions redeveloping the “Vaunted” KERS system, which is all part of Formula 1’s Code Green mandate. As we know, (THANKFULLY!) Ferdi-the-Putz (Alonso) faultered in the season finale – losing the Drivers Title fight to Master ‘Zebb, nee Sebastian Vettel, and Ferrari finished third in the Constructors Championship; hence their respective car numbers following Red Bull & McLaren. The driver lineup remains intact for a second year, while long time tester Luca Badoer has left the Prancing Horse outfit – being primarily replaced by Jules Bianchi, although I saw somewheres that “FishyFellah” (Giancarlo Fisichella) & Marc Gene are still on the Maranello Payroll.